Sunny skies and calm seas – such a contrast to the week before . Those that ventured out enjoyed excellent conditions , followed by coffee and hot x buns. We tried out a new sea anchor drone to help land in rougher seas – it is very effective at providing drag. Also a new design of tholes with string on the end to stop them popping out whilst rowing – also good. 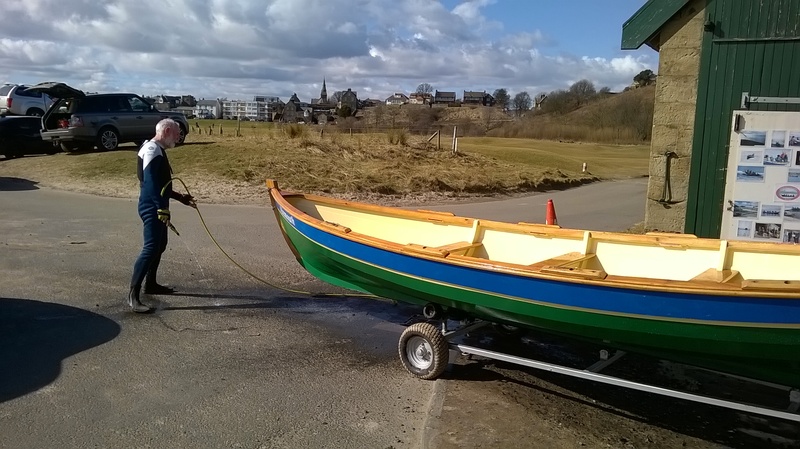 Below is a picture of John hosing down the freshly painted skiff with loving care . Also a newly renovated sand trailer.